Partners in Progress is a multi-track neuro-conference focusing on issues related to: individuals with brain injury and family members, children and adolescents in the school system, advocacy, and professional and clinical training. 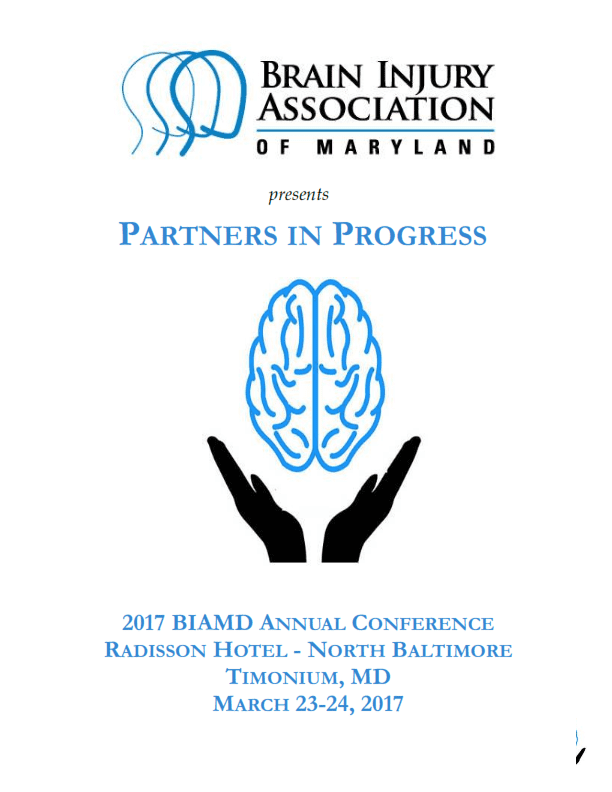 The purpose of the two-day conference is to provide state-of-the-art information about brain injury treatment, services, research, and advocacy, and to improve collaboration and networking between individuals with brain injury, families and professionals. O'SHANICK - Preventing a Serious Public Health Problem Around Mild Traumatic Brain Injury: How did we do? ALLEVA/PETERS - Tips and Tricks to support communication in Aphasia. GRUNWALD - Nonverbal Communication in Conversations: What Does It Mean? KERRIGAN - Why does it matter what they are coded? LAUTERBACH/LOEFFLER - TBI, CBT, DBT? What to do? Psychological and neuropsychiatric care of the patient with TBI. Relaxed rooms come with free Wi-Fi, flat-screen TVs and coffeemakers, as well as desks. Room service is available. Parking is complimentary. There's also a polished restaurant/bar, a seasonal outdoor pool and a poolside bar, plus a 24/7 fitness center, 2 ballrooms and 17 meeting rooms. ♦ The Maryland Board of Social Work Examiners certifies that this program meets the criteria for Category I continuing education for social workers and associates licensed in Maryland. ♦ The Maryland Board of Psychologists has stated that CEUs provided through the Maryland Board of Social Work Examiners will be accepted for those wishing psychology CEUs.